J. Hans D. Jensen was a nuclear physicist at the University of Heidelberg. He was awarded the 1963 Nobel Prize in Physics along with Eugene Wigner and Maria Goeppert Mayer "for their discoveries concerning nuclear structure." June 25, 1907Birth, Hamburg (Germany). 1932Obtained PhD in Physics, University of Hamburg (Universität Hamburg), Hamburg (Germany). 1932Scientific Assistant for Theoretical Physics, University of Hamburg (Universität Hamburg), Hamburg (Germany). 1936Obtained DSc in Physics, University of Hamburg (Universität Hamburg), Hamburg (Germany). 1937 – 1949Docent (1937-1941) and Professor of Theoretical Physics (1941-1949), University of Hanover (Technische Universität Hannover), Hannover (Germany). 1947Member, Heidelberg Academy of Sciences (Heidelberger Akademie der Wissenschaften), Heidelberg (Germany). 1947Honorary Professor, University of Hamburg (Universität Hamburg), Hamburg (Germany). 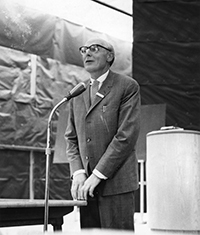 1949 – 1969Professor of Physics (1949-1969) and Emeritus Praecox (1969), University of Heidelberg (Universität Heidelberg), Heidelberg (Germany). 1951Visiting Professor, University of Wisconsin, Madison. 1952Visiting Professor, Institute of Advanced Study, Princeton University. 1952Visiting Professor, University of California Berkeley. 1953Visiting Professor, California Institute of Technology (Caltech). 1953Visiting Professor, University of California, San Diego. 1955Wrote "Elementary Theory of Nuclear Shell Structure". 1956Visiting Professor, University of Minnesota. 1963Awarded Nobel Prize in Physics along with Eugene Wigner, Maria Goeppert Mayer "for their discoveries concerning nuclear shell structure". 1964Member, Sacri Romani Imperii Academia Naturae Coriosorum. February 11, 1973Death, Heidelberg (Germany). PhD advisor at University of Hamburg (Universität Hamburg). Shared 1963 Nobel Prize in Physics for their discoveries concerning nuclear shell structure. Advised by Jensen at University of Heidelberg (Universität Heidelberg). Docent and Professor of Theoretical Physics. Obtained PhD in Physics (1932) and DSc in Physics (1936). Scientific Assistant Institute for Theoretical Physics and Honorary Professor. Professor of Physics and Emeritus Praecox. Hans Eduard Suess papers, 1875-1989.
International Congress for Physics [motion picture]/ photographed by Heinrich Medicus. Joseph Edward Mayer papers, 1920-1983. Maria Goeppert Mayer papers, 1925-1973. Oral history interview with Thomas Lauritsen, 1967 February 16. Stefan Rozental papers, circa 1940-1989. Elementary theory of nuclear shell structure/ [by] Maria Goeppert [and] J. Hans D. Jensen.